Google stores every information it gets from you and is very kind to show it to us. But Google has made it very difficult for you to find out all the information it has captured by tracking you and this is why this article gives you all the direct links to locations where you can find out all the information you share with Google. You can see all the locations where you travelled if Google has a history for that and you can also download all your data on Google, even your YouTube videos if you want to keep a backup of that. Read on to know all the awesome information you can get from Google, which obviously is collected from you. If you want to delete your Google account or you just want to keep a local backup of everything you have on Google, you can do that simply by going to the Google’s Takeout page. Google lets you download everything that you added to your Google account including Gmail data, Calendar entries, Contacts, Bookmarks, and your Google Drive data besides all the other stuff. If you have an Android device then there are good chances of your location being sent back to Google servers. Not only your location, Google also knows about the speed at which you are moving, if you are moving at all. If you wish to see all the places you travelled while having your Android device with you, then head over to the Location History page on Google. You can also export your location history in KML format, which can then be opened and viewed using Google Earth. Google keeps a log of every search you make on Google. Navigate to this link to see your past search history. You can also remove the search terms that you don’t want to exist in your search history. If you don’t want Google to keep a track of your search terms, then you can easily turn it off using this URL. This is a feature provided by Google where you can specify what you want to happen to your emails, photos, documents and other stuff that you have on Google, if your account gets deleted. You can also specify if you want your information to be shared with any of your friend or family member, or you want it to be deleted straightaway. Your account gets deleted after 9 months when you last sign-in to Google. But the 9 months duration can be extended to 18 months if you wish to save your account from deletion using Inactive Account Manager. One more special feature of this service is to send a text message and/or email when your account is to be deleted. 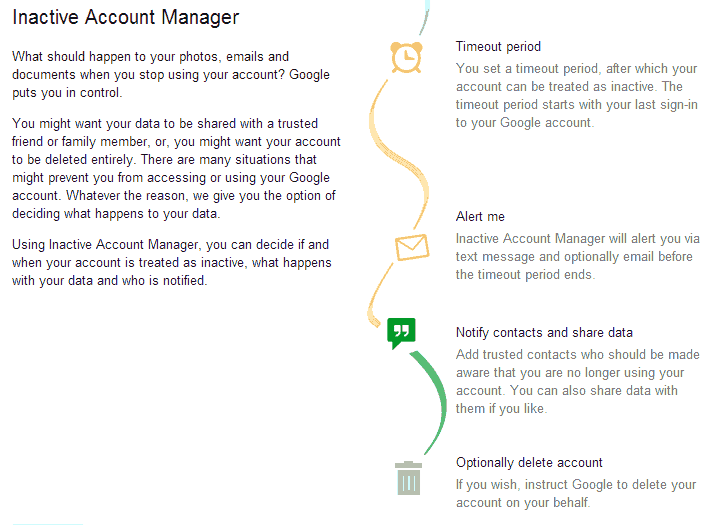 This can be taken as a warning and you can login to your Google account to save it from deletion. Many websites and applications that lets you sign in using Google, can access your data. Some of them need read access to your basic profile information, while some of them can have read and write access to your data like Contacts, Emails or your Google Drive files. If you ever wish to see all the apps you have granted access to your Google account along with the access level, then you can visit the Account Permissions page of Google. You can also revoke access from any application you have stopped using on this page itself. Google stores the time, the IP address, the browser and the operating system whenever someone signs in to your Google account. This information is useful to check if someone else is accessing your Google account. 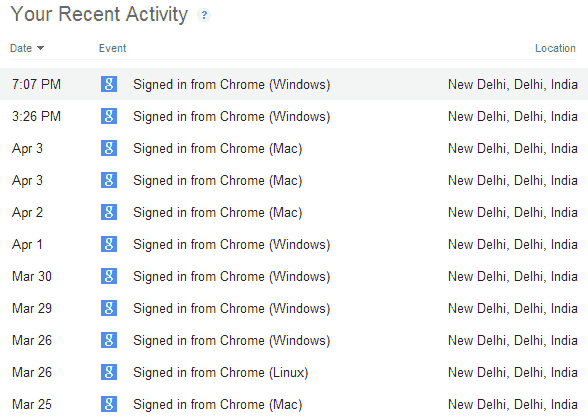 Google also shows the approximate location from where your Google account was accessed. This location is approximated using the IP address. The usual sign-up process for a Google account uses a Gmail account as your Google account’s primary and login email address. But very few people know that Google also allows you to sign up for a Google account with email addresses other than Gmail as well. Follow this link to sign-up for a Google account using a non-Gmail email account. Google shows all the Google products you use, along with some of their basic information at a glance on the Dashboard page. Google analyses all your browsing habits and interests, and creates a profile on the basis of those. This profile is then used to show you the most relevant ads, both on Google and across all of its partner websites. To view and edit the profile on the basis of which Google displays ads to you, you can go to the Ads settings page. If you have a Google apps account for your domain, and the account ever gets compromised, then you can follow a special URL to get the account back. Google will ask you to add a CNAME to your domain’s DNS Zone file to prove that you own the domain. domain.com needs to be replaced with your domain name. Google is very strict about piracy and duplicate content. If you find any piece of your content that is available on any other website without your consent, and the website is using any of the Google product, like Adsense, Blogger, YouTube, etc, then you file a DMCA complaint. This DMCA complaint can also be raised to remove any website or webpage from appearing in Google search results. If you ever get fed up with Google and decide to remove your public profile (I don’t think anyone will ever do that), then you can follow this URL to delete your Google profile. Along with your Google profile, all your Google Plus data and your YouTube profile will also be deleted, all your YouTube videos will be made private too.